This small shed features the same color scheme, siding and roofing material as the house for a perfect match. When a shed offers double doors such as this, it's far easier to move equipment in and out, plus there's more natural light too. 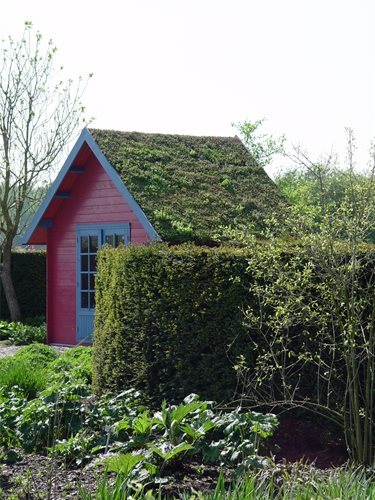 Bright paint and a planted "green roof" gives this shed a jaunty look in the landscape. 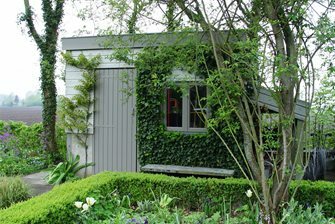 This older shed has been upgraded with new windows, a creative entry door and the facade nestled into the landscape with ivy and vines. This lovely little shed blends right into a tree covered woodland site as though it's been there for ages. 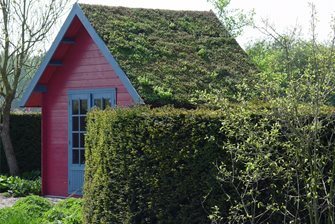 When you build a shed that features a lovely architectural theme, it becomes far more than just a place to put your lawn mower. 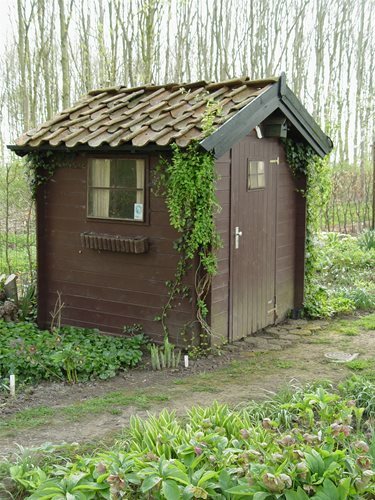 This large garden shed provides the ideal place to store large bulky items without crowding the garage. Shop ShedsFind the right shed or greenhouse for your backyard. Choose from a variety of prefab structures. 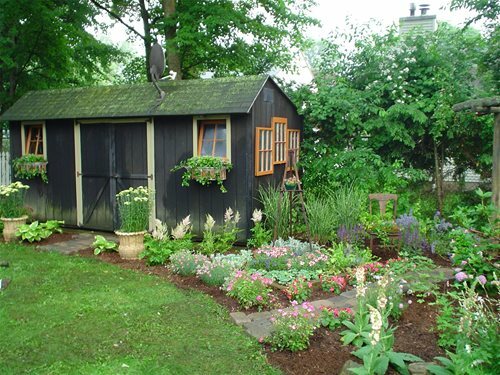 Garden sheds are liberators. They provide a handy place to store all your tools, equipment and supplies so they don't clutter up the garage. Adding one to an existing landscape or designing a shed into a new home plan can improve the function of your homesite and offer useful space for projects. All of this requires some thought as to exactly how you plan to use the shed and what you'll store there. This is because there are so many possible variations on this theme that dictate what choices are the best for your site, your budget and the overall character of the landscape. The primary question is whether you plan to make the shed visible or not. This has a huge bearing on how the shed looks, and if it must be detailed to fit nicely into the scheme of the yard. Knowing this in advance can streamline the process and answer many other questions long before you start considering what kind of structure to use. 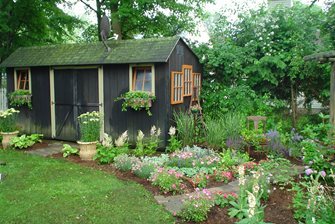 For avid gardeners or where there's a sizable food garden, locating the shed close to this part of the yard can be highly beneficial. You'll spend less time going back and forth, allowing your seed, fertilizer, tomato cages and other handy items to be there when you need them. 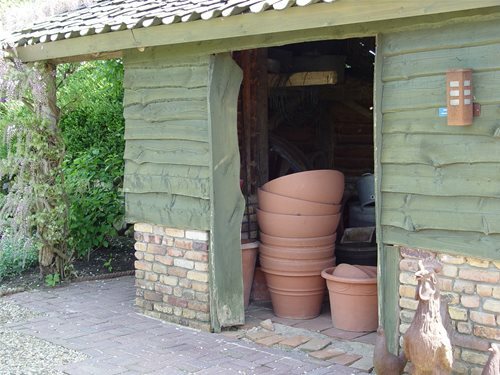 If there is a greenhouse on the property, consider its relationship to the shed as well. The kit shed is designed to solve the problems encountered when there's minimal or no access to the location where you want the shed to sit. The company that sells the kits usually provides a crew to deliver and erect the shed on site, which takes only a few hours to a day to complete. This shed requires the same gravel pad as a prefab. Again, portable structures aren't covered by building codes and may be prohibited in planned communities. 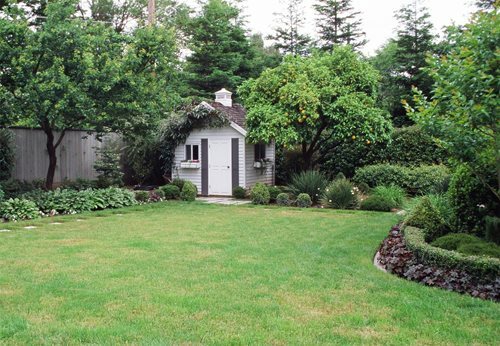 This shed is treated like a pool house, gazebo or any other outbuilding in the landscape. It requires a building permit and must conform to UBC codes. An approved foundation is required. Structure setbacks from the property line may also apply. Electrical hook up for lighting may increase costs. Many companies offer plans to build attractive quality garden sheds along with barns and a variety of other out buildings. Using these allows you to submit a complete set of plans, saving you the cost of hiring a professional to design and draw them. However, if you want the shed to become a direct extension of the home architecture, it may be wise to use the same architect for both. Design ConsiderationsLike any other structure, its size and footprint is dictated by how you plan to use it. Size also influences costs because larger sheds cannot be obtained prefab, which may force you to build from scratch. The biggest issue for northern homes is space for winter storage of accessories for outdoor living spaces. It may hold everything that needs to survive the cold from furniture cushions to barbecues. 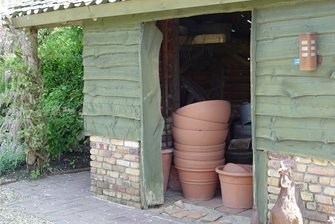 You may also wish to create a potting station within the structure to allow you to work in the garden on rainy days. Fitting all this into the footprint floor plan before you finalize size is vital to ensuring you have enough room for everything. 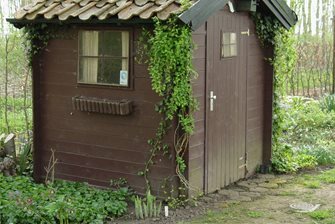 Because garden sheds may contain larger equipment such as lawn mowers, wheel barrows and even a garden tractor, proper access is essential. This requires you to consider how you'll access what's inside while working in a vegetable garden or maintaining the lawn. Wide walkways free of encroaching plants make it easy to move everything in and out. A shed for a riding lawnmower, lawn tractor or other equipment requires a wide door you can drive right through. If you plan double doors you can move equipment in and out without squeezing through a single four foot doorway. Double doors also allow you to open one end of the shed to create a covered work space with natural light. This additional indoor-outdoor space is perfect for performing maintenance tasks on gas engines or may also include your potting area. Pro Tip: If your shed is tall enough to create a loft space inside, it's ideal for storing rarely used items without sacrificing ground floor space. 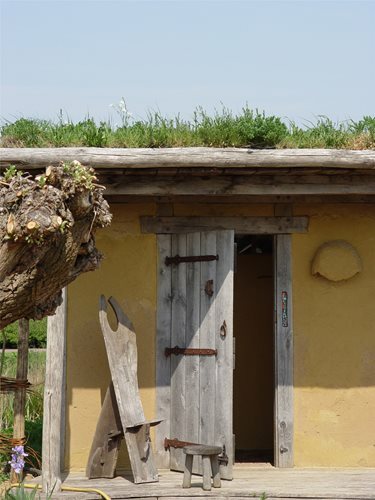 Style and DetailsFor sheds that are hidden behind plants or other structures, style isn't relevant provided the structure functions well for your individual needs. But where the shed is visible, style is essential to the cohesiveness of your landscape. Whenever possible, mirror the architectural style of your house with detailing, roof lines, color, materials and proportions. If you have a gambrel roof house, then select a similar structure for the shed. If your home is painted white clapboard, select a shed with similar looking siding and paint it to match the house. For natural cedar or log homes, select similar siding on the shed. 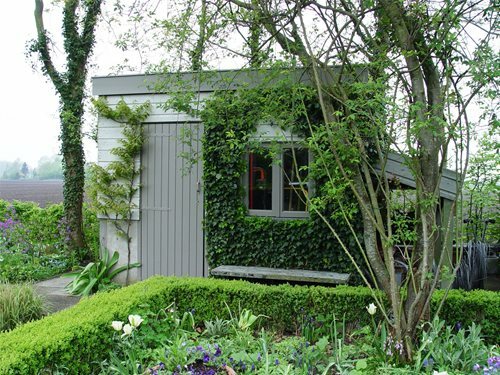 A popular trend today is to make a garden shed a visual amenity with planting to give it a powerful presence no matter how mundane the design. Just because it's used to store tools doesn't mean it can't be cute or elegant depending on the landscape character. Faux paint textures can even make siding mimic the look of stucco or stone. Adding window boxes, shutters, a cute door or wall art to the shed makes it appear coordinated rather than looking like an afterthought. 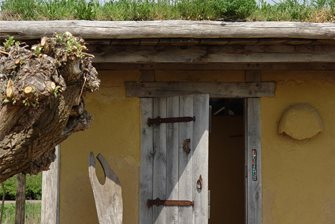 Without outbuildings like these, there is always conflict between gardening tools and the rest of your garage. Creating one to hold these items close to where they will be used is a real time and labor saver. Above all it moves these items well away from your cars. For those with fine automobiles, the cost of repairing scratched or dented auto paint may vastly exceed the price of the shed. Maureen "Mo" Gilmer is a landscape designer, author, and speaker about horticulture topics and landscape design.